For a lot of folks that statement is going to conjure a lot of negative emotions, but allow me to explain. We absolutely want to keep that old-world quality, attention to detail, and (the most difficult) the wide range of services that traditional gunsmiths would offer. But the sad truth is that, along with that romantic ideal of the traditional gun-builder, comes a lot of less appealing facts; zero customer service, a lack of professionalism and order, intermittent quality control, no email, and most of all, staggeringly long turn around times. Now, some of those aspects just add to the charm, but when the chips are down they can also be frustrating. We constantly are striving to improve our quality and the consistency of our work, to improve our communication and your ability to follow your project, to always reduce turnaround times, etc. In short, to create an environment where you feel comfortable, even excited, to drop off your prized firearms. Here at Brimstone Gunsmithing, we consider ourselves to be 'practicing gunsmithing,' in the same way that a doctor is practicing medicine. We are good at what we do, we are honest about our capabilities, and we are constantly questioning the way we think about firearms. The firearms world is phenomenally dynamic; technology pushing what firearms are capable of, top tier shooters changing the way they are used, and missions/events constantly changing the demands of the shooters and firearms. We try and live right in the middle of all of that, and see ourselves as facilitators, connecting you with all the best in knowledge, skills, and tools. We work with a number of law enforcement and military agencies, both on a professional and personal level. Most of the staff here is previous military or first responders, and we pride ourselves on 'getting it' when you have a particular project in mind. We are also comfortable and have the scale to handle larger agency sized projects. Our goal is to provide quality products to our customers which truly fit their needs and (hopefully) their budget. 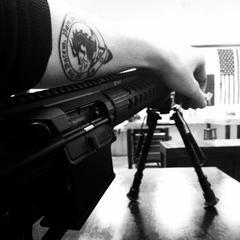 We go out and use these guns, we use the products we preach. How often have you bought a part that you thought was going to really work well, only to be disappointed when it arrived? We try to keep that from happening to you, allowing your budget to stretch farther. To accomplish a particular goal we can advise which parts need to be premium, which can be left factory, and what needs to be something in the middle. Sometimes we can even provide advise on how to do the work yourself. We are gun people, and love helping out.